Sadie M. Ingalls, or Po-Naw-po-qua, was born October 12, 1890 in Oklahoma to two members of the Sac and Fox Tribe, Horace, or Pe-shaw-kaw Ingalls and Maddie, or Ash-kaw-soque Seals. Her father died of tuberculosis before Sadie enrolled in Carlisle. Sadie was left in the care of her mother who sent her to Carlisle after nine years of reservation school. Sadie began her time at Carlisle in September 1906. She spent intermittent years at the school and on leave until 1912 when she turned 21. Students on leave from Carlisle spent their time living with and working for a white family. 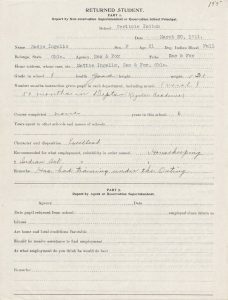 Sadie’s student file reports three years that she spent in New Jersey with a Mrs. Henry Brooks. Sadie did general housework for the family for wages of $12. While no records survive of Sadie’s experience in New Jersey, a field agent reported the home as good and the Mrs. Brooks as “a practical business woman, excellent housekeeper. 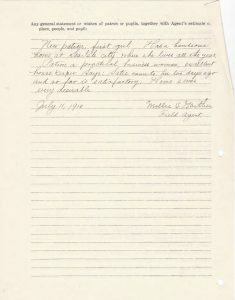 Much of the report is left blank, such as number of days at school and trade at school, suggesting that Sadie did not attend school while working for the Brooks’, although she would continue to pursue her education afterwards. At school Sadie was described by her teachers as of excellent character and disposition. She was very active in the school and participated in several clubs. Sadie was elected critic for the Mercer’s Literary club, and later corresponding secretary. She was a member of the YWCA and was able to go to the YWCA conference one year. She was even elected class secretary her sophomore year. After school, Sadie spent some time at home before moving back east to pursue her studies further. Sadie attended college in Philadelphia for several years, and reported moving to Washington D.C. in 1917. In 1918 she married Mark Feder, a white man also born in Oklahoma. They lived together in Oklahoma until 1930, when Mark Feder died. Sadie lived another three decades before dying in 1967 in Oklahoma. Little survives of Sadie’s own account of her experiences at the Carlisle Indian School. Her student file contains letters she wrote to the school asking for help entering college and receiving money she had left behind. She expresses gratitude and speaks in a familiar tone, however she does not give her opinion of the school, nor could she given her reasons for writing. This entry was posted in Sadie M. Ingalls, The Conflicted and tagged Ancestry Library, Student Information Card, The Carlisle Arrow. Bookmark the permalink.